Loughborough History and Heritage Network | Radio Times at Loughborough cont. Radio Times at Loughborough cont. The Electrical Engineering Department at Loughborough College first set up a wireless laboratory in 1920 and the following year secured a licence for transmitting and receiving. The College’s call sign was G2 PI and a 100 foot aerial was erected on the roof of the College buildings in town (where Sainsbury’s supermarket now stands), directly over the canteen. There are plans for the radio masts in the University Archives. The College also had a licence for a portable transmitting and receiving set working within a ten mile radius with the call sign G2 PJ. By 1923 an Experimental Laboratory, using this call sign, had been set up at the College playing fields, where interference was less. 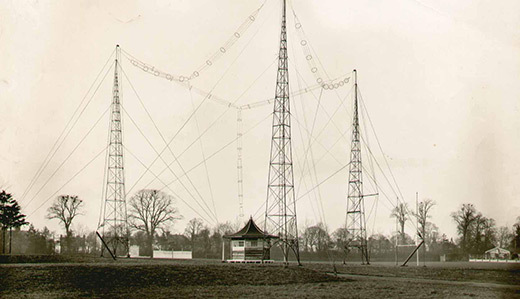 The wireless aerials were supported by three latticed steel masts 110 feet high which stood in a triangle around the small pavilion that housed the Radio Research Station (located in the vicinity of the present rubber crumb sports pitch near the main entrance to the university on Epinal Way). The Loughborough College Wireless Society was formed in the autumn of 1920 and it was soon reported that there was not ‘any other Wireless Society outside London to whom has been granted the number of concessions for carrying out wireless experimental work, as have been granted to the College’. The Wireless Society’s Receiving Room was housed in a hut built on the roof of the canteen. Renamed the Radio Society in 1923, it operated as part of the Electrical Engineering Department. The Wireless Society arranged broadcasts, lectures and demonstrations, including practical classes for instruction in Morse. Much of the equipment for the Wireless Laboratory was made in the College Workshops. In 1922 a new loudspeaker was installed in the College Club Room so that members could listen to broadcasts from the newly founded BBC, whose first daily radio service was launched that November. Soon the Society began to transmit its own concerts. The very first featured songs performed by members accompanied on the Club Room piano and was received by wireless enthusiasts as far afield as Nottingham, Derby and Burton on Trent!